There is good evidence that the Ice Age people who were using Sheriden Cave were hunting peccaries for food. This picture shows a fragment of a peccary scapula with an almost perfectly round hole. The bone spear point laying through the hole, in this picture, was found near by and may be the projectile that brought down this animal 11,000 years ago. The tip of this point does have some impact damage. 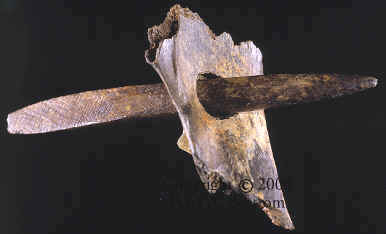 These two artifacts are positioned to show the direction from which the spear point perforated the bone. These pictures show both sides of what appears to be the point of impact from a Paleo-Indian's bone spear point. The one on the left shows the smaller entrance hole and the picture on the right shows the larger exit hole. These two rare bone spear points were found inside Sheriden Cave. One was discovered during the earlier paleontological project and the other during the archaeological excavation. The one on the left is the most recent find in 2000. The tip of the point on this one is in very good shape and is even slightly polished. The example to the right was found in the earlier excavation in the summer of 1995 by Kenneth Ford while excavating the skeleton of a flat-faced peccary. This point has some very slight point damage and is believed to be the one that perforated the peccary scapula laying near by. The majority of all Paleo-Indian bone and ivory spear points found in the United States have been found in the east. Almost all of these are made of ivory and were found in the rivers of Florida where preservation has been very good. But examples have also been recovered from a few sites in the west. The similarities of the bone and ivory artifacts and the fact that they are separated by thousands of miles help archaeologist understand the movements of these early nomadic people. Two of the projectile points from Sheriden Cave are made of bone and are very rare. The bases of the points, pictured here, are tapered where they were attached either directly or indirectly with a foreshaft to a spear. They also have a crosshatching design cut into the bases. This "roughening" probably helped attach them more firmly in the haft with the use of tree resin (mastic) or other adhesive substances. 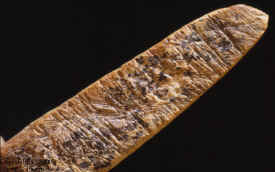 This picture shows the 2 1/8 inch long "ladder" style engraving cut on one side of this bone point from Sheriden Cave. 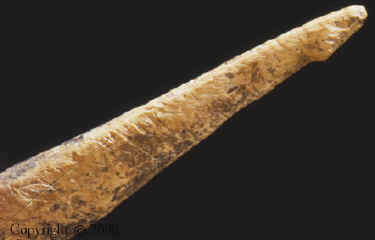 Although thousands of miles away, the Clovis bone rod pictured below has a similar design also cut on one side. 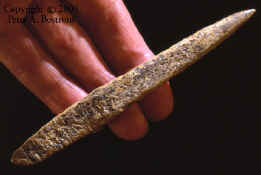 This picture shows the engraved area on a double beveled bone rod found on the East Wenatchee Clovis site in Washington. 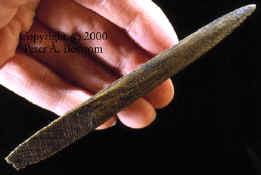 The "ladder" style engraving on one side of this artifact is similar to the bone spear point from Sheriden Cave shown above. Similarities like this, although their function is not completely understood, help to make cultural connections between widely separated sites. The base of the more recently discovered bone point from Sheriden Cave was fashioned with a small knob on the end. Since it's in the hafting area it must have been used to help secure the point to the spear. This is the only complete stone spear point found during the excavation of Sheriden Cave. Another fragment of a biface was found but a positive identification as a projectile could not be made. 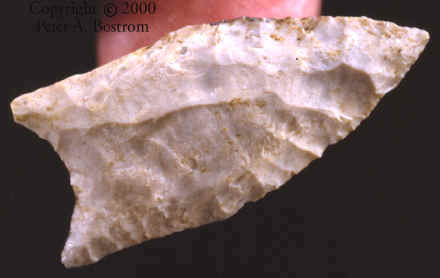 This fluted point was found in 1998 by Paul J. Barans less than three feet from where the first bone point was discovered in 1995. It has been extensively resharpened and it doesn't seem likely that it would have undergone any further resharpenings. It's possible that it may have even been discarded by the original owner when he replaced it with a new point on the end of his spear or foreshaft. Paleo-Indians were hunting with a wide range of sizes of fluted points. Some of them seem too small for the animals they were hunting. A fluted point measuring 1 1/4 inches long was found on the mastodon kill site at Kimmswick. Even smaller fluted points have been found on other Paleo-Indian kill sites. This example measures 1 3/8 inches long but could have been at least 2 inches long when it was newly made. 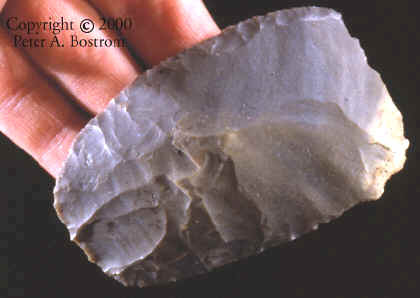 This is the largest and best example of a stone tool that was found during the excavation of Sheriden Cave. It was discovered several years ago during the earlier excavation. This is a uniface tool that would have been used for cutting and scraping. As for size, the fake is much wider than most side-scrapers found on Clovis sites. Uniface side-scrapers have been found on Clovis sites across the United States in caches, on camp sites, stone tool manufacturing sites and kill sites. This example is made of southern Indiana chert and measures 3 1/4 inches long and 2 3/16 inches wide.